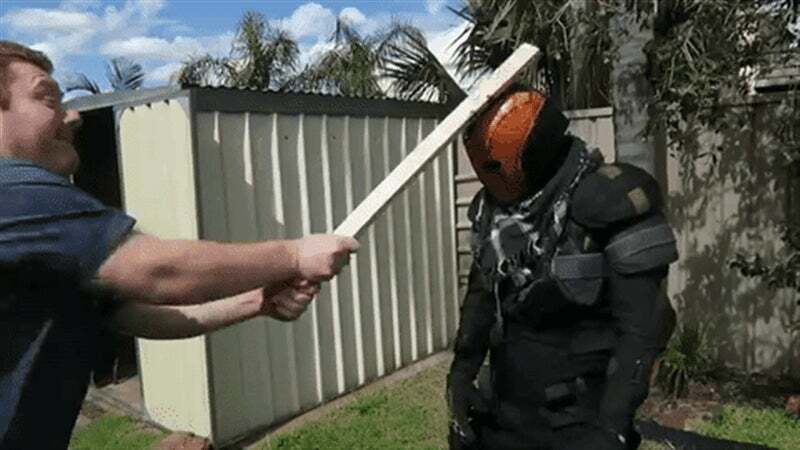 It's one thing to look like DC villain Deathstroke, it's another to build your cosplay outfit so that it could actually protect you from Batman punching you in the head. Or some guy smacking you around with a piece of timber. And an axe. This outfit/helmet is by Friggin Boom Toys, who shot the video below that not only puts his helmet through its paces, but gives you an idea of how it was put together using fibreglass to take that kind of punishment. Don't try this at home, these are untrained amateurs! Seriously, the force going down that guys neck is super dangerous and he's lucky if he only gets a headache from it.